A number of RV dealers throughout the country are surprising their customers with extra fees at the time of sale. These dealers will agree on a price with the buyer at the time of sale, but an delivery day the final price you pay is much higher. These extra dealer fees can include freight, prep and miscellaneous surcharges which can add up to hundreds if not thousands of dollars! Here at Wilkins RV, we believe in customer satisfaction before, during and after the sale. That is why we offer Wilkins RV All Inclusive Pricing. With our all inclusive pricing policy, all you pay is the price of the RV, tax and DMV fees. We don’t add for a freight charge, prep charge or battery charge. The price we give you is the price you pay! Additionally, our all inclusive price policy is about competitive RV pricing. As a result of Wilkins RV’s 80 years in business, we are growing to be one of the largest RV dealers in the country. Our huge buying power give us leverage with RV manufacturers to negotiate better deals. This allows us to pass those saving on to our customers. Shop our huge selection of New RVs and Used RVs with confidence knowing that there won’t be any surprise charges at the time of sale. 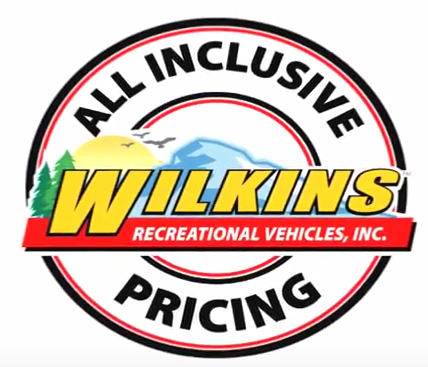 Get a great, upfront Wilkins RV sale price on a wide variety of motorhomes, fifth wheels travel trailers, lightweight campers and toy haulers. With four RV dealerships in New York, there is a local RV store near you. Visit one of our locations in Bath, Churchville, Syracuse or Victor, NY and see how our All Inclusive RV Pricing can save you money.